Doping is cheating, it undermines the principles which make participating in sport worthwhile and is one of the most common concerns among USA Cycling’s membership. That is why USA Cycling is collaborating with riders, teams, Race Directors and Local Associations, as well as the US Anti-doping Agency (USADA), Cycling Anti-doping Foundation (CADF/UCI) and the World Anti-doping Agency (WADA) to fight doping at every level of the sport. All athletes deserve a level playing field and sense of fairness in their competition. Established in 2013 and revamped this year, the RaceClean Program funds anti-doping tests at both the elite and amateur levels of cycling. The program utilizes the testing resources of USADA, which employs sophisticated methods to test professional and amateur athletes across a wide range of sports. The program also utilizes USADA for adjudicating cases and implementing penalties. Testing works, and penalties can be significant – even for amateurs. A first-time offender can be suspended from the sport for up to four years, and a second offense can lead to a lifetime suspension. Testing: Who conducts the tests? Who gets tested? The anti-doping landscape in the United States is complicated, with multiple groups working both together and separately to test at all levels of competition. Below is a breakdown of testing based on who conducts tests, who funds the tests, who is tested and where they are tested. This is intended to give you a better idea of where RaceClean fits into the puzzle and how your RaceClean surcharges are spent. Growing the RaceClean presence at the amateur level is made possible by the $5 RaceClean surcharges added to Cat 1 mountain bike, and Cat 2 and 3 road, track and cyclo-cross memberships; the $25 RaceClean surcharge added to pro mountain bike and Cat 1 road, track and cyclo-cross memberships; and the $50 RaceClean surcharge added to UCI pro road licenses. 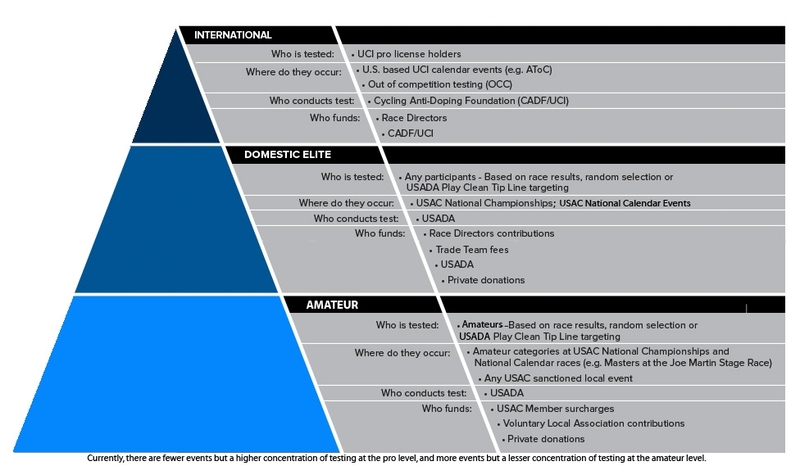 USA Cycling has raised the bar for RaceClean with the goal of tripling its 45 tests performed on amateurs in 2015 to 135 tests in 2016. Click on the monthly reports at the top of this page to see the most up-to-date numbers. USADA makes available a number of ways to report the abuse of performance enhancing drugs in sport in an effort to protect clean athletes and promote clean competition. One of the most effective tools has been the free PlayClean Tip Line which is available to call at 1-877-752-9253 if you have knowledge of someone using performance enhancing drugs or techniques. Testing is expensive. The more funding that RaceClean receives, the more we can test. If you would like to contribute, members may click here to make a donation from their account page. Non-members can call our office at 719-434-4200 and make a donation by credit card. TUE (Therapeutic Use Exemption) - Athletes can determine if they are required to have a TUE and learn how to apply for a TUE and learn how to apply for a TUE. Play Clean Tip - Where athletes can submit reports/allegations/suspicions of doping infractions to USADA.